Minister Richards said, “The Government with the support of The Speaker has rescheduled the House of Assembly debate on Airport redevelopment legislation to Friday, February 10th, instead of this Friday’s sitting. “The rescheduling will allow Opposition MPs more time to review documents related to the project, which has been more than two years in the works. “The new date followed a helpful decision by the Canadian Commercial Corporation [CCC] and Aecon, the project’s prime subcontractor, to approve the release of the draft Airport Project Agreement – a decision that set aside customary commercial practices for the sake of transparency. “I want to express my appreciation to CCC and Aecon for agreeing to the release. It will enable Bermudians to see as clearly as possible that this is the right deal at the right time for the right reasons. “From the beginning, the Government has moved with care to protect Bermuda’s interest and to work around our challenging fiscal situation to build something that serves the Bermudian people for generations to come. “I welcome any further examination brought on by the release of the draft agreement because it so clearly works for Bermuda, including guarantees to complete it on time and on budget. “Most importantly this project will have no impact on our national debt, leaving Government free to maintain our spending priorities for education, pensions, health and social safety – things that really matter to people in their day-to-day lives. “The evolution of the Airport agreement has set a new level of transparency for Government capital projects. I can safely say that there is no other infrastructure project in Bermuda’s history that has released more information to the public than this one. “In addition, I have arranged for key project representatives to speak directly to members of the Opposition for a better understanding of its financial details. “Despite this unprecedented level of transparency, the Opposition Leader continues to cry foul even though he is in possession of virtually every detail of the draft agreement and relevant project information. I would simply urge him to get focused on the project not the politics so we can move Bermuda forward. “The decision to reschedule the debate to February 10 followed a series of meetings this week and last with The Speaker and the Opposition Leader to calm community tensions before the resumption of Parliament. 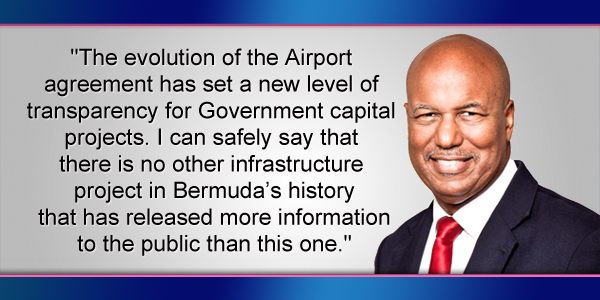 Update 2.54pm: In response, Opposition Leader David Burt said, “Bermuda’s Parliament is being asked to give approval to the Airport Redevelopment Project and it is imperative that the entire Project Agreement is made available for review. “I would remind the Minister of Finance that it would be impossible for parliament to give proper scrutiny to this deal without viewing the Financial Model for this “Public Private Partnership”. “MPs have received all Project Agreement schedules except for Schedule 29 which contains the Financial Model. The figures contained in the Financial Model are referenced numerous times in the Project Agreement specifically regarding the commitments of Bermudian Taxpayers. This isn’t about politics it is about basic transparency and respect for the role of Parliament as the people’s representatives. “This is the first time in Bermuda’s modern history that we have ever privatised the operation of a major asset. There is a reason this agreement needs Parliament’s approval and that is because, unlike the hospital project, it diverts revenue from Government coffers to a private company who will operate the airport. MPs cannot be asked to give consent to an agreement they haven’t seen. This project has indeed been the most transparent project any government has engaged in. We currently have more information available to us before full contract closure, than even the Acute Care Wing has available after over 2 years since project completion. For the PLP, and their surrogate agents the BIU and PC, to continue to complain and try to criticize the government about transparency is a poor reflection on their standing policy of party politics first before country. They have repeatedly moved the goal posts with demands and misinformation in an effort to continue their criticisms and demonstrated that the PLP is indeed Bermuda’s post-truth party. They demand disclosure, but offer none, as their is much they have to disclose about the miriad of invisible sling they conducted during their administration. Dealings that repeatedly cost taxpayers tens of millions of dollars, of not in the hundreds on projects alone. And that doesn’t account for the roughly $800m in unaccountable public monies that are still a mystery from when they managed the public purse. The PLP owes more disclosure to the residents of Bermuda than the OBA at this point. Agree 100%. PLP?BIU/People’s Campaign motives are very clear – power at any cost. Tell ya Milk man to call the election I’m tired of both parties. Not my milk man, I’m bipartisan, just tired of how much the PLP have sought to drag this country down so they can get back on top of us. It’s a same to the good and honourable members of the party who are actually in it for the people, but as they have always been done, they are dressed out with token positions or sidelined by those with agendas for power. If it wasn’t for the PLP and and the Union this deal would’ve been gone through with partial information and suspect incentives. I know it’s a hard pill to swallow but this deal was shady from day one. Except all the information shows there is nothing shady about it, an advanced and complex PPP, but not shady. The only thing shady has been the constant misinformation and false statements issued by the combined opposition, none of which has survived the facts as they have been presented over the last couple years. Those who think this could have unfolded any clearer or faster show either their inexperience and lack of understanding for such dealings, or their petty politricks. You’ve never had any substance to your arguements and now your running out of narrative, seems the pill has always been stuck in your throat. PLP economic stimulus created $2 b in debt. The OBA refused to add to this irresponsible spending and borrowing. The OBA has initiated smart and creative solutions to stimulate and diversify the economy such as the America’s Cup and a new airport. The airport will provide many new jobs and a new facility that will reflect well on the island, without any debt! If the PLP had thought of it, they would have done the same thing.